A golf club is used to strike the ball in the game of golf. It has a long shaft with a grip on one end and a weighted head on the other end. The head is affixed sideways at a sharp angle to the shaft, and the striking face of the head is inclined to give the ball a certain amount of upward trajectory. The rules of golf allow a player to carry up to 14 different clubs, and each one is designed for a specific situation during the game. The origins of golf are shrouded in history and probably evolved from other games in which a small object was struck with a stick. The Romans had a game called Paganica, which involved hitting a stone with a stick. The French had a similar game called chole, while the English had cambuca, which used a ball made of wood. Possibly the strongest claim to golf comes from the Dutch, who were known to play a game called kolfas early as 1296. In its original form, kolfwas played on any available terrain including churchyards, highways, and frozen lakes. The object was to hit a succession of targets by striking the ball with a long-handled wooden club. To allow a clear shot, the ball was slightly elevated on a pile of sand called a tuitje, from which we get the modern term tee. The Dutch claim to the origin of the game is hotly disputed by the Scots who point out that they had been playing golf for as long or longer than the Dutch. Whatever the origin, there is no dispute that it was the Scots who popularized the game. It became so popular that in 1467 the Scottish Parliament passed an act banning golf because it was taking time from archery practice necessary for national defense. The ban was widely ignored. Ironically, the first manufactured golf club was made by a Scottish bow maker named William Mayne, who was appointed Clubmaker to the court of King James in 1603. Early golf clubs were made entirely of wood. Not only was this material easy to shape, but it was also soft enough not to damage the stuffed leather golf balls that were used until the mid-1800s. With the introduction of the hard rubber gutta-percha golf ball in 1848, golfers no longer had to worry about damaging the ball and began using clubs with iron heads. Because iron heads could be formed with sharply inclined striking faces without losing their strength, iron-headed clubs, called irons, were most often used for making shorter, high-trajectory shots, while wooden-headed clubs, called woods, were used for making longer, low-trajectory shots. Until the early 1900s, all golf clubs had wooden shafts whether they had iron heads or wooden heads. The first steel-shafted golf clubs were made in the United States in the 1920s. It was about this time that some club makers started using the current numbering system to identify different clubs, rather than the old colorful names. The woods were numbered one through five, and the irons were numbered two through nine. The higher the number, the more inclined the surface of the striking face. The putter rounded out the set of clubs and retained its name instead of being assigned a number. The sand wedge was developed in 1931 to help golfers blast their way out of traps. In time, the sand wedge was joined by several other specialty golf clubs. In the early 1970s, manufacturers introduced golf clubs with shafts made from fiber-reinforced composite materials originally developed for military and aerospace applications. These shafts were much lighter than steel, but they were expensive and some golfers felt the new shafts flexed to much. Later, when ultrahigh-strength fibers were developed to control the flex, composite shafts gained more acceptance. The first metal-headed drivers were developed in 1979. In 1989, they were followed by the first oversize metal-headed drivers. The oversize heads were cast with a hollow center and filled with foam, which made them the same weight as smaller wood heads. When combined with a longer, light-weight composite shaft, the oversize metal woods achieved a greater head velocity at impact and drove the ball further. The over-size club heads also had larger striking faces, which made them more forgiving if the ball was struck off-center. Today, the design and manufacture of golf clubs is both an art and a science. Some club makers use the very latest computeraided design and automated manufacturing techniques to build hundreds of thousands of clubs a year, while others rely on experience and hand-crafting skills to build only a few dozen custom-made clubs a year. Golf clubs are manufactured from a wide variety of materials, including metals, plastics, ceramics, composites, wood, and others. Different materials are chosen for different parts of the club based on their mechanical properties, such as strength, elasticity, formability, impact resistance, friction, damping, density, and others. Club heads for drivers and other woods may be made from stainless steel, titanium, or graphite fiber-reinforced epoxy. Face inserts may be made from zirconia ceramic or a titanium metal matrix ceramic composite. Oversize metal woods are usually filled with synthetic polymer foam. Traditionalists can even buy woods that are made of real wood. Persimmon, laminated maple, and a host of exotic woods are used. Wood club heads are usually soaked in preserving oil or coated with a synthetic finish like polyurethane to protect them from moisture. Club heads for irons and wedges may be made from chrome-plated steel, stainless steel, titanium, tungsten, beryllium nickel, beryllium copper, or combinations of these metals. Heads for putters may be made of all of the same materials as irons, plus softer materials like aluminum or bronze, because the velocity of impact is much slower when putting. Club shafts may be made from chrome-plated steel, stainless steel, aluminum, carbon or graphite fiber-reinforced epoxy, boron fiber-reinforced epoxy, or titanium. Grips are usually made from molded synthetic rubber or wrapped leather. The rules of the United States Golf Association (USGA) have only a few brief paragraphs regarding the design of golf clubs. There are no restrictions on weight or materials, and only a few restrictions on dimensions. Shafts must be at least 18 in (457 mm) long. The distance from the heel to the toe of the head must be greater than the distance from the face to the back of the head. The cross-sectional dimension of the grip must not be greater than 1.75 in (45 mm) in any direction. Of all the rules, however, the most important one requires that the club ''shall not be substantially different from the traditional and customary form and make." It is this last rule that sometimes gives club designers the fits. It means, for example, that club heads may not have features like aiming fins or holes to reduce aerodynamic drag. Shafts may not have flexible joints, and so forth. In short, anything that is not "traditional and customary" is not allowed. All new club designs must be submitted to the USGA for review and approval before they may be used in tournament play. The golf club head is molded in a process called investment casting. Once cast, the head is heat treated to harden the iron. alter the general shape of the club in an attempt to help both professional golfers and weekend duffers improve their games. One common feature of modern irons is perimeter weighting, which places most of the club head weight around the edges, leaving the center with less material. This added mass reduces the amount of club twist when the ball is struck towards the edge of the club, rather than in the center. The effect is to increase the size of the effective hitting area, or the "sweet spot" as golfers call it. The hollow oversize metal heads on some drivers have the same effect. Another design feature of some modern clubs is the offset head, where the striking face is located to the rear of the centerline of the shaft. This places the golfer's hands slightly ahead of the ball at impact, which tends to square the club face and give better direction control. Other design features help golfers make cleaner shots from uneven terrain, get the ball up in the air from grassy lies, and correct their tendency to hit to one side or the other. As with any product, some features offer more psychological help than physical help. Despite three decades of golf club design improvements, the driving distance of the best professional golfers increased only 12 yd (11 m) between 1968 and 1995, and the average winning score fell at a rate of only one stroke every 21 years. Every golf club maker uses a slightly different manufacturing process. The largest companies use highly automated machinery, while the smallest companies use hand tools. Some parts of the manufacturing process may be unique to one company and regarded as trade secrets. Here is a typical sequence of operations used to produce a machine-made, perimeter-weighted golf iron. 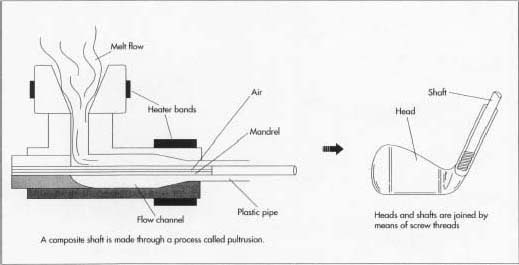 If the shaft is made of steel or stainless steel, it is formed by a process called tube drawing. The shaft is connected to the golf club head with screw threads. club head is made from metal. The die consists of two halves with a hollow cavity that is the exact shape and size of the desired club head. Molten wax is poured into the die cavity and allowed to harden. 2 When the wax is hard, the die is opened, and the wax pattern is removed. This process is repeated several times. Several wax patterns are attached to a central wax column, called a sprue, to form a tree. 3 The tree is dipped into a liquid mixture of powdered ceramic material, various chemicals, and a gelling agent. It is set aside until the coating dries. The tree is then placed in a container, and the container is filled with a liquid molding slurry, which is allowed to harden. 4 The hardened mold is heated to about 1,000-2,000° F (550-1,100° C) in an oven to melt the wax patterns. The melted wax runs out the bottom and any wax residue is vaporized. The mold is then inverted. 5 Molten metal for the club head is poured into the hot mold and allowed to harden. When the metal has cooled, the mold material is broken away from the tree, and the individual cast heads are cut off the sprue. The investment casting process produces parts with an excellent surface finish and no flash or parting lines to remove. The parts can be made from a wide range of metals and their weight is uniform from one part to another. 6 Most iron heads are heated treated to harden the outer surface. The head is heated either with a flame or an induction coil, and then quickly cooled. This causes the steel near the surface to form a different grain structure that is much harder than the rest of the head. 7 If the shaft is made of steel or stainless steel, it is formed by a process called tube drawing. A tube of the desired length is pulled part way through an opening in a die slightly smaller than the tube diameter, which causes the drawn portion of the tube to neck down in diameter. This process is repeated several times. Each time the die diameter is made slightly smaller, and the length of tube pulled through the die is several inches less. The result is a tube that decreases in diameter from about 0.50 in (13 mm) to about 0.37 in (9.5 mm) in seven or eight small steps spaced along the length of the shaft. If the shaft is made of steel, it is chrome plated after it is formed. 8 If the shaft is made of graphite fiber-reinforced composite material, it is formed by a process called pultrusion. 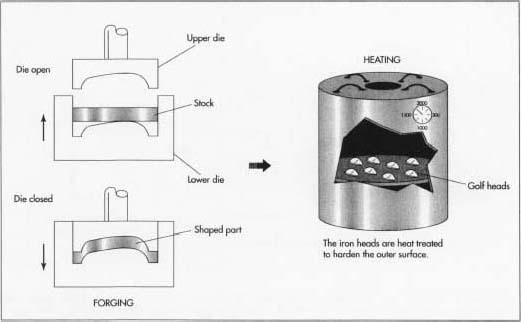 A bundle of graphite fibers is pulled through a circular opening in one or more heated dies while epoxy resin is forced through the opening at the same time. The graphite fibers become imbedded in the epoxy and the heat makes the epoxy harden to form the shaft. The shaft is then cooled by air or water and cut to length. Graphite fiber-reinforced shafts are the same diameter along the entire length. 9 There are several ways to fasten the head to the shaft. With some metal shafts, the shaft is inserted into the socket on the head and a small hole is drill crossways through both the socket and the shaft. A small metal pin is then pressed into the hole and held in place with an epoxy adhesive. With graphite shafts, the head is bonded to the shaft with an adhesive. This second process is becoming more common for all shaft materials, including metal shafts. 10 The other end of the shaft is placed in a hollow die and a rubber grip is molded around its upper portion. The shaft may then be labeled with an adhesive sticker to show the manufacturer, brand name, degree of flex, or other information. 11 The raised metal parts are polished to give the club a finished appearance. As a final step, any recessed lettering or logos on the club head may be filled with paint or another color finish. Adhesive stickers or adhesive-backed metal plates may be affixed to the club head for identification or decoration as well. Golf clubs are treated with almost as much attention to specifications as components for aircraft. In fact most golf club manufacturers emphasize their specifications as a means of differentiating their clubs from the competition. Swing weight, lie angle, shaft torque, and a host of other specifications are not only important to the club designers, but are also important to the company's customers. In addition to dimensional checks and process controls, clubs are randomly tested for a variety of specifications that affect performance. The popularity of golf is expected to continue to grow. As the number of recreational players increases, there will be an emphasis on designing clubs that make the game more enjoyable for the average golfer. Despite objections from purists, oversize club heads and other game-improving features will continue to be offered. Plumridge, Chris. The Illustrated Encyclopedia of World Golf Exeter Books, 1988. Zumerchick, John, editor. Encyclopedia of Sports Science. Simon & Schuster MacMillan, 1997. Crecca, Donna Hood. "Fore!" Popular Science (February 1995): 56-60, 84. Sauerhaft, Rob. "Easier than Ever." Golf Magazine (October 1994): 56-57. Sauerhaft, Rob. "Iron Wars." Golf Magazine (April 1998): 168-169. Cobra Golf, Inc. http://www.cobragolf.com . Karsten Manufacturing Corporation. http://www.pinggolf.com . United States Golf Association (USGA). http://www.usga.org . do you have any information about the manufacture of the driver? i'm doing an product study on the driver and i can't find any good information about its manufacture. This has been a great help to me! If anyone needs a resource of manufacturing and design structures, this is a great website to look upon. I highly recommend this to anyone who knows about golf or is searching for information about the game. Thanks! Why is the club shaft located to the side or end of the club face instead of centered at the moist likely point of impact with the ball.? Is that tradition or rules?